OK Jax area peeps - Here's one way to help end hunger locally and have a great night out as well. 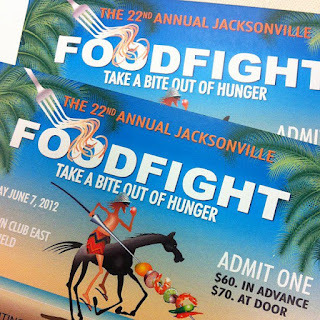 Up for grabs are two regular admission tickets to the 22nd Annual Jacksonville Foodfight - Thursday June 7 from 6:30 - 9 pm at the Touchdown Club East at Everbank Field. Face value is$60 each ($70 if you purchase at the door). All you need to do to enter is leave a comment telling us your favorite local restaurant dish. No worries if you can't pick just one fave - tell us your top three to five! One randomly selected entry will get both tickets. One entry per person, but if you link to this post in a tweet with the hashtag #nourishthebeast you'll automatically get a second chance entry. 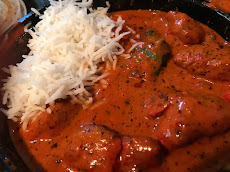 By the way - good luck figuring out what your favorite dishes are - I'm still thinking about mine. Contest ends Monday at 8 pm. The winner will be announced Tuesday. AND if you don't win the tix - there's still time to get to Foodfight - it's for a good cause - The event has raised more than $1 million to help fight hunger in Jacksonville over the last 20 years and hopes to raise at least $100,000 in 2012 - with all proceeds benefiting Second Harvest North Florida. I'm going to go with: ANYTHING from French Pantry! Sounds like you've figured out where to grab some great food here in Jax, Jessica! Good luck on the drawing. One of my fav's is the Ruby Red Grapefruit Martini at Seasons 52. That has real fruit in it! And another favorite is the formaggi pizza at Pele's. I like that 'tini too, Cam! At Mitchell's Fish Market they add muddled basil - sounds odd but it really works! Good luck on the drawing! I've got two favorites right now - the Shrimp and Scallops with Mac/cheese from Blue Fish Grill and the Filet Mignon from Bistro Aix. Gonna have to try that seafood dish. ANYTHING at Bistro Aix is my fave too! Old school awesome. Good luck on the drawing, Carrie! The Platillo del Mar or the Tacos al Pastor at La Nopalera always make me happy. The Banana Split in a cup from Dreamette is a classic guaranteed to make me smile. And way out in the wilds of Orange Park, I'm gradually working my way through the menu at Manny's Bistro, where so far everything I've tried has been phenomenal! I'll have to give Manny's a visit - thanks for the tip! I LOVE Dreamette - soo close to my office, too! I love the Mahi Mahi with grits and collard greens at Palm Valley Fish Camp. Yummo! Sounds great - I love their crabcakes with spinach as the side. AND CLAMBELLIES!!! Oooh - yes! And their lobster potstickers! I love anything from biscottis... Especially the risotto specials! And of course, cake! Mmmm - I'll take one of everything from that dessert case! Good luck in the drawing, Ashlee! Pho from Saigon Time always lifts my spirits and makes my tummy happy! The coconut milk soup from Pataya Thai, I believe the Tom ka. Awesome soup, have to get it everytime. The samosa's from India's restaurant. Shout out to edgewood bakery's croissant donut- pure bliss. I LOVE Saigon Time! The Autumn Roll and pork Banh Mi are my go-to lunch. In winter, it's the Pho - for sure! Thanks for dropping in at NTB - Good luck in the drawing! I agree, Kathryn. If you haven't tried the 13G Grilled Cheese at 13 Gypsies, you owe it to yourself to check it out too. They make their own cheese and bread - and its just as you say - simple - but fantastic. Thanks for stopping by - and good luck in the drawing! Oh my. Where do I start...! Let me think... The Chicken "Sandwich" from Jenkin's BBQ, the Duck Confit Grilled Cheese from Olio, the Cuban Sandwich from Pinegrove Deli, pretty much everything from Chomp Chomp, BBQ Nachos & Granny Sandwich from Monroe's BBQ, Fish Tacos from the Burrito Gallery, the Costa Rican Breakfast & the Eggs Benedict at Cool Moose, the Croissant Doughnut from the Edgewood Bakery, Burgers from the Fox, and cupcakes from B.U.I. (gotta love what you serve!). Best part about all of the wonderful foods is that they're all under $10! We're a budget conscious family and there are a lot of great places we can go eat and have marvelous food while on budget, how great is that!?! Violet - you have completely cracked the code on some great food - simple, fresh, great, a cut above, and all very affordable! thanks for the list - I definitely have some work to do here. Isn't Pinegrove Deli's Cuban amazing? And the ONLY thing that could top that croissant donut is the chocolate covered one! I confess I have been known to eat TWO of those with my morning coffee once in a blue moon... AND great that you mentioned cupcakes - that's my next culinary exploration - so my friends and I will be checking out BUI's for sure! Thanks for reading and good luck in the drawing! I love the Chicken Sandwich at Salt Life Cafe. It's called the Yard Bird. I don't know what's in the sauce they use but that with a piece of pineapple over the chicken is amazing. And their fries are so good dipped in that same sauce. I LOVE the poke bowl - but I get the shrimp one and have them sub out the shrimp for poke. LOVE the pineapple chunks in there too! Thanks for your entry - good luck! Thanks for all the entries and food inspiration! Winner will be announced Tuesday! See you at Jacksonville's Foodfight! Congratulations to Katie Douthett - Your Twitter entry was selected randomly as the winner! I have DM'd you to arrange pickup of the tickets! See you at FOODFIGHT! Thanks again, everyone - I look forward to checking out some new fave dishes!